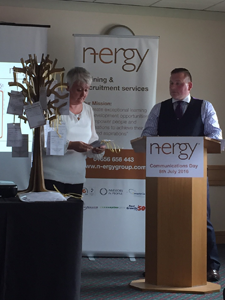 One of the activities that our PI&IG (Positive Improvement & Impact Group) (*) organised for Communications Day which took place earlier this month on Friday, 8th July at Chepstow Racecourse celebrating n-ergy’s 9th Birthday was the launch of an n-ergy Tree of Values! The focus group members came up with the idea for the Communications Day event; everyone in n-ergy could express the way they carry out and deliver n-ergy’s company values when working with our learners and/or colleagues in their day-to-day work by completing the “Living the Company Values” cards which were then placed on the n-ergy Tree of Values. 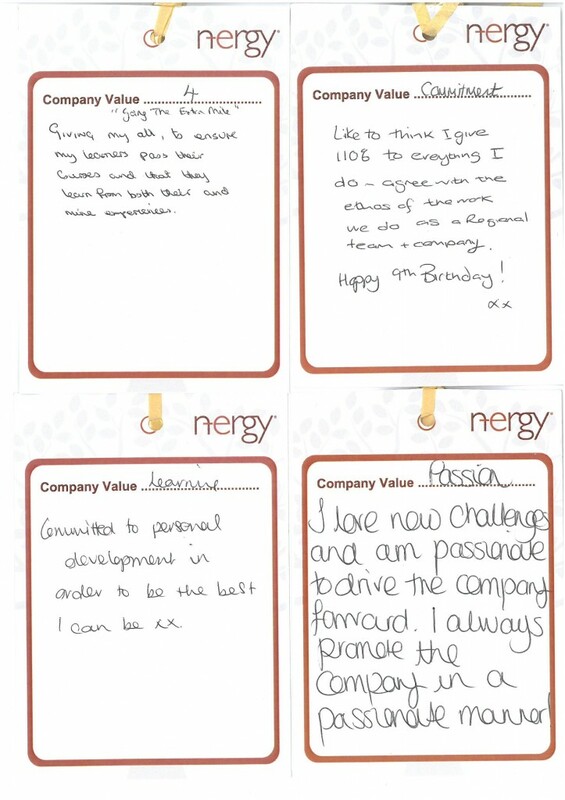 All our six company values were selected by n-ergy’s employees with Company Value No:4 – Going the Extra Mile – leading the way! 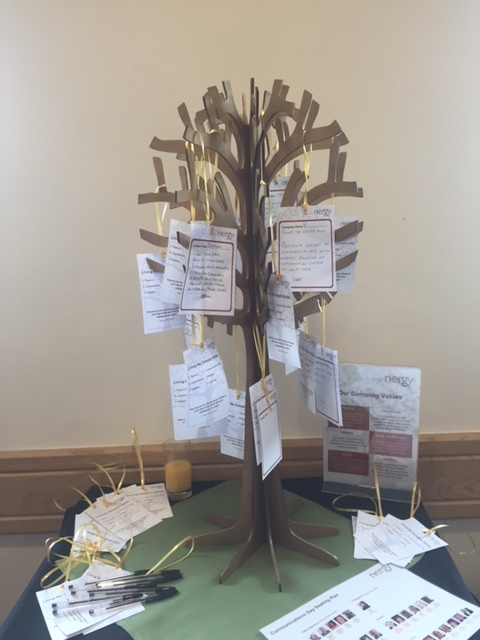 Please see below just a few of the completed handwritten cards displayed on the n-ergy Tree of Values at our Bridgend Head Office and also published in our internal employee weekly e-newsletter, “soundbite”. Here is a link to view our company’s Vision, Mission and Values. (*) n-ergy employee focus group (PI&IG) has a membership of six employees including a Chair (all working at different levels within the company) representing all the regions / areas of the business who meet quarterly. The purpose statement of the focus group is “To provide a voice for n-ergy’s workforce to continually identify, evaluate and implement business improvement ideas that will make a positive impact on the company and its people”.